You finally brought your new puppy home, and now it’s time to begin training! There is no magic formula to having a well-behaved dog; it takes determination and time to teach your dog the manners and the social skills they need to thrive. At the Animal Medical Center of Streetsboro, we’ve put together some tips for training your puppy to help you get started on the right track! The biggest job as a pet owner is to help your puppy learn to interact and get along with not only you but other people and other pets as well. Dogs are very social creatures, so it is essential that the rest of the family and other pets enjoys the company of your dog and seeks out their company. Teach your puppy self-discipline by laying down clear rules and sticking to them. For example, if you want them to stay off your furniture, don’t scold them for jumping up one day and then invite them up on to the couch for a snuggle the next day. Consistency is vital when establishing rules for your puppy. Puppies love to chew. It is a natural and healthy behavior for them, so it is essential to provide them with the right toys or treats to chew. Without the proper things to chew on your puppy will chew whatever they can reach, including anything from shoes to the television remote. If your puppy is chewing on something they shouldn’t be, be sure to scold them and say something like “No!” and take the item away, replacing it with an appropriate chew toy. This will help them learn what is and what isn’t a chew toy. It’s important never to punish your dog physically or in other harsh ways. Emotional and physical abuse will cause your dog to become fearful and untrusting, which could lead to the dog adopting defensive behaviors such as biting. 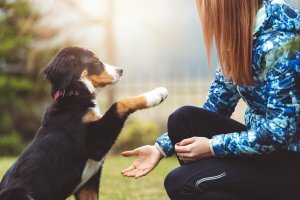 Dogs respond better to positive reinforcement, so it is important to focus on rewarding good behavior with toys, treats, and praise, rather than trying to deter bad behavior. This will help give your puppy motivation to please you, helping to establish a strong bond between you. It takes time for them to learn, so be patient and stay consistent with your puppy’s training for the best results. Call the Animal Medical Center of Streetsboro to learn more about our basic and advanced canine care and how we can help keep your puppy healthy.